This is this week's Fall-To Layout #56. 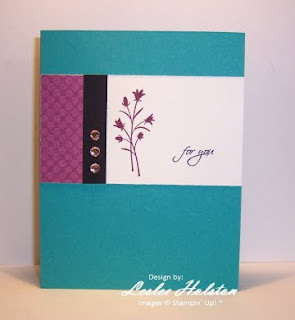 The Clean & Simple Stamping blog features a Fall-To Layout each Friday. This particular layout is simple and elegant and allows plenty room for embellishment...if you so choose. Isn't it gorgeous? I love these colors together. Bermuda Bay, Basic Black, Very Vanilla and the Rich Razzleberry dotted dsp from the Razzleberry Lemonade paper pack. Great vibrant colors that perfectly compliment each other! The sentiment, in Basic Black, is from the All Holidays set and the image, stamped in Rich Razzleberry, is from Pocket Silhouettes. The only embellishment is the three Fashion Jewels from Michael's. I hope you like it? Comments are welcome. 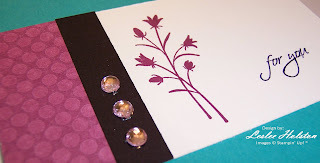 Be sure to check out the Clean & Simple Stamping blog. You're sure to find something that inspires you.